I often joke and call myself an example of recessive genes. Growing up, I fully expected to be tall since both of my parents are six feet tall. Sadly, as I hit puberty and stopped growing, I realized that I was only going to be 5’3". As the vertically challenged member of a tall family (my brother is also six feet tall), I often tried to wear high heel shoes. Of course, the reality is heels are often uncomfortable and leave your feet screaming. When I first started teaching, I would wear heels and then at night be close to tears. After I had my first son, I learned that nice looking comfort shoes were more important than adding three or so inches. Sure, I was able to get a few pair of heels that worked for more dressy occassions, like going to synagogue, but they were few and far apart. My trusty Aerosole heels are really starting to get worn out and look horrible. For quite some time, I have been searching for the new perfect shoes to have when I need something more than my flip-flops, sneakers, Teva and slides. Several months ago, people started to chat a lot about the new line of wedges and heels from Crocs. Yes, you read that right. The brand that many connect with the bright orange shoes that Chef Mario Batali wears now sells stylish heels using their comfort technology. At the end of June I won a Twitter giveaway sponsored by Crocs (thanks George Smith Jr – you are the best). I was told to select a pair of shoes that I would like as my prize. I immediately went to look at the wedges and heels. I selected a pair of Sassari to try. My shoes arrived on Monday. After I stopped jumping up and down, I put them on. It took me a few minutes to remember how to walk in heels, then I was able to run after the boys with my Sassari on. Please excuse my toes that are in need of a new paint job, but here are my cute new shoes. I really love these shoes. I can see wearing them all town. I hardly feel like I have three inch heels on. All week I have been wearing them around the house to break them in. I can not wait to wear them to places and shock people when they find out that they are Crocs! Are you a creature of comfort or will you wear anything in the name of style/fashion? What is your favorite pair of shoes, fancy or not? Great shoes! I fully expect comfort, I do not care about fashion. But “pretty and stylish” comfort. I wear the original Crocs everyday. If the shoes are not comfortable I will not wear them. I want only comfortable shoes. I lived in my pink fuzzy crocs until they gave out last winter! They were the MOST comfortable shoes ever….however hubby said they were my most hidious shoes ever. I still plan on replacing them. Love my flip flops (crocs play a big part in that one! ), but I still wear my sneakers the most. Too afraid of bugs not to. Love the notion of a comfy heel though. I did read recently that crocs might go bankrupt. Scary thought, eh? 99% of the time I go for comfort. But I do own one ridiculously high pair of black heels that I wear to extremely formal events. As for my favorite pair of shoes, I have a pair of slip-on Vans that I love. Almost all of my shoes I picked for comfort. My favorite are a pair of sneakers. thankfully, all the jobs i’ve had didn’t call for high fashion. i’ve worn heels only on special occasions and my feet are happy feet because of that fact. so, i’m definitely a creature of comfort. I generally go for comfort, but shoes are the one area where I’m willing to pretend I don’t know what comfort means. I always seem to find the most excruciatingly painful pair of shoes and, of course, they’re the ones that look best. Luckily we’ve moved back to the starving student phase of life, and now all my shoes are getting well-worn and – dare I say – comfy. I’m a creature of comfort. I wear Birkies (Birkenstock) must of the time. I do have some shoe that are not comfortatble, but I do not wear them anymore, I need to give them away to the needed. because at my age comfort is the number one…only.. choice. I’m surprised that these are Crocs! I’m not a fan of the original style, but these I would try. I’m all about comfort. It’s either sneakers or flip-flops all summer long. I go for comfort unless for a special occasion.. maybe a wedding or something like that I will wear a pair of heels that kill my feet! I am a flipflop kinda girl and thankfully I live in Texas and can wear them pretty much year round!! My favorite shoes are my Skechers crocs. LOVE them! So comfy and easy to slip on during hot weather. I don’t care about fashion all that much. I wear flat shoes even though I’m short because I’m not about to suffer a backache for the sake of fashion. I am definitely a creature of comfort! Love your shoes! Too cute. I love cute but I really want to be comfortable and that is hard to find! I have some really cute “10 minute” shoe that hurt after 10 minutes but man are they cute! Thanks for stopping by and leaving me a comment. Turkey with coleslaw. That is a new one to me but I think I would like it. It would sorta be a turkey, mayo, and lettuce and I know I would like that. I host 5 Things Friday. Next week will be 5 Things I know for Sure. I hope you will stop by and join in sometime. Blessings. I love Crocs too – though I haven’t seen the ones you have on – I think I can do those! OH, I am 5’2, so I totally feel your pain! Another brand I love is Fly Flot – They are so comfortable! 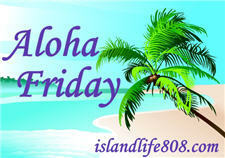 Thanks for stopping by my blog for Aloha Friday! I am all about style! Now, that doesn’t necessarily mean I will wear a pair of shoes that hurt my feet, but as long as they aren’t uncomfortable I’m ok! My favorite pair of shoes are BCBG strappy metallic sandals w/ about a 4 inch heal! I’m ALLLLLL about comfort. I wear my shoes till they are talking to me! Right now I’m kicking in an old pair of Vans classic shoes. They are dirty and smell but they are for work mostly. On the weekends I’m in flip flops. Comfort for me… I don’t care as long as it feels good on my feet. I have a great pear of crocks that I just love. I almost bought those twice the past couple of years. I want the pink and white ones they have on Shoebuy.com. I am glad you like them and they are comfortable as I have yet to find anyone that owns them for a review. I have a pair of their flip flops (with the cloth toe thingys) and they are pretty darn comfortable. Now back to your question: I am such a creature of comfort. When I find a good pair of shoes, I will buy them in every color as I know they will work. Who cares about variety when it comes to comfortable shoes. I’m about comfort, thank you very much. I haven’t worn a pair of heels since the high school prom. Of course, I’m 5’9″ and my hubby is only 2 inches taller, so I really don’t need them. I wear whatever is comfortable. Isn’t it great when you find a pair of shoes you love? Ahhh…. I can tolerate some discomfort in the name of style, but I draw the line at blisters, ugh. Comfort. Summer I’ve been wearing a cheap pair of flip-flops. Then regularly sneakers. Those are CUTE! I’m checking out the website. PS. I tried the rubbing alcohol on my camera. It seemed to work for half a day, but then it went right back to the low battery thing. Since it’s a 8-9 year old camera, I decided to get a new one. Picked up a Canon Elph last night that I’ll be playing with this weekend. I should be back to my Scenes from our Day posts soon! Thanks for sharing about the rubbing alcohol though. Glad it worked for your camera, and I’m sure it will work for someone else too! I am a creature of habit, but I LOVE shoes. However I only get to ogle them and not indulge. And honestly as a SAHM, I’m barefoot pretty much all the time! I’m a creature of comfort with some glam thrown in. Now that I’m older, I go more for comfort. Up until a few years ago, I didn’t even own a pair of slippers (flip flops). Now that’s all I wear! Kinda a creature of habit…I love flip flops! Those are super cute! I may have to give in to my anti-Crocs mentality and give them a try. I’m a creature of comfort! My favorite shoes are a pair of old Etnies I can slip on!